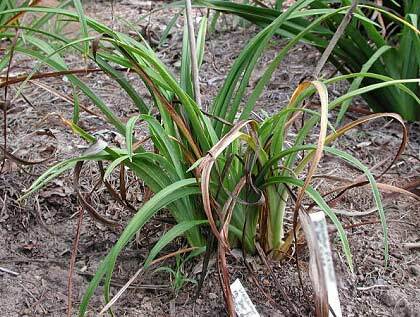 There are several different organisms that may be involved in rot diseases of daylilies, such as species of the fungi Fusarium, Phytophthora, Rhizoctonia, Pythium and Sclerotium as well as bacterial soft rot caused by Erwinia. In 2004, a fungus generally associated with woody plants was identified in diseased daylilies for the first time. Armillaria root rot infection is known most commonly as “Shoestring Root Rot” in North America because of the shoestring like structures it produces, and in some other countries it is referred to as “Honey Fungus” due to the color of the mushrooms. The text below has been kindly written for us by Dr. Guido Schnabel of Clemson University, who made the initial identification of this disease in daylilies. 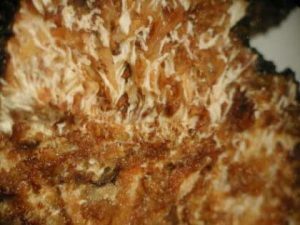 This fungus is not likely to be a common cause of rot disease in daylilies but could be a possibility when gardens have been cleared from woodland, or where there are dead or diseased trees or shrubs known to be infected with Armillaria. A new fungal pathogen on daylilies. G. Schnabel, Department of Entomology, Soils, and Plant Sciences, Clemson University, Clemson SC 29634. schnabe@clemson.edu. 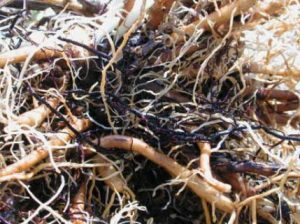 Armillaria root rot disease is a soil borne pathogen that primarily affects woody plants but occasionally is reported on herbaceous species. In June 2004, the disease was discovered for the first time on daylilies. The diseased plants were located in South Carolina and grown in well drained loamy soil that is supportive of Armillaria root rot disease. The site used to be woodland and was just recently cleared. Daylilies were planted around multiple hardwood stumps and an Armillaria root rot symptomatic dogwood tree. Symptoms were similar to drought stress and included poor growth of the plant and yellowing of leaves. A cross section through the crown of wilting plants revealed necrotic areas with fan-shaped, white fungal mat growing inside. In some instances, mycelial fans were also discovered in primary roots. Black shoestring like rhizomorphs were found on and near the daylily and dogwood roots and in other places of the yard. These rhizomorphs are produced by the fungus to explore the area and look for new prey. They are initiated on a food base, such as tree stumps. The causal organism of the Armillaria root rot disease in daylily was identified as Armillaria gallica H. Romagnesi & Marxmüller based on genetic fingerprinting. This species is most prevalent on the west coast and in the mid west of the United States but is also known to be a pathogen on trees on the east coast. It produces gill-bearing mushrooms typically in the fall at the base of infected trees and sometimes on shallow roots. The mushrooms grow in clusters, are brown, and possess an annulus (ring) around the stalk. Cultural or chemical control options have not been established for this new disease on daylilies but research is in progress. Armillaria Root Rot on daylily. Mycelial sheets in nectrotic tissue of a daylily crown. Rhizomorphs intermixed with daylily roots.